The Nuremburg Racial Laws were a series of rules that dennied Jews the right of citizenship. They identified the Jews as simply Hitler's 'subjects'. The rules also prohibited Jews from marrying or having cool relations with Aryans, as well as from employing Aryan women as household help. The Nuremburg Laws were only the beginning in a long chain of actions that would ultimately take away all rights the Jews had as human beings. 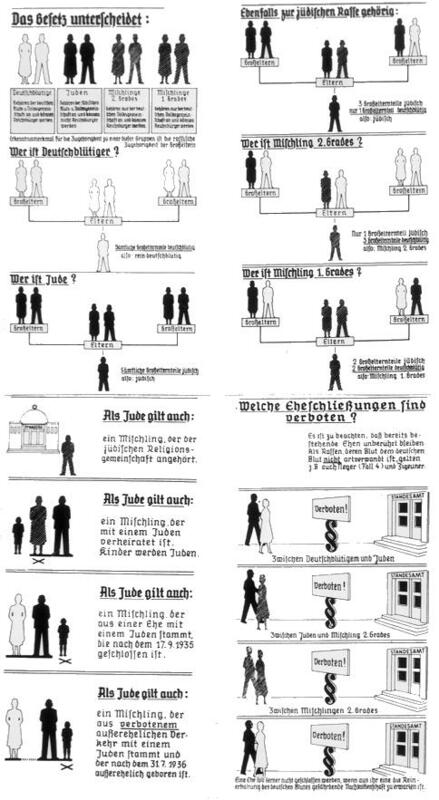 Shown at left is a chart designed by the Germans simultaneously during the passing of the Nuremburg Laws. It identifies the three different groups of Jews: the 'full Jew', the 'Jew of first degree', and the 'Jew of second degree'. Full Jews had three Jewish grandparents; first-degree Jews had two Jewish grandparents; and second-degree Jews had only one.